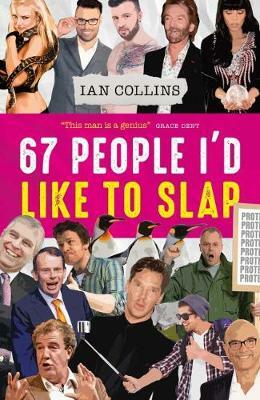 67 People I'd Like to Slap is one man's journey through the labyrinthine world of human angst and annoyance. The comedy writer, broadcaster and journalist Ian Collins lists, exposes and mocks that irritating contingent of the human race whose job, it seems, is to make life just a tad more infuriating than it needs to be.From psychics to exotic pet owners, Brits using chopsticks and over-35s at music festivals, through to middle-class protesters, elderly people in small cars and the billion cringe-crimes that are committed on social media every day (plus a healthy dose of well-known names too), Collins's often brutal but hilarious search into the pit of human idiocy leaves few stones unturned. He also addresses some of life's most serious questions:* Is Jeremy Clarkson part of a completely different gene pool? * What happens when you upset every Beyonce fan on the planet? * Why is Andrew Marr's sofa an affront to intelligent thinking? * How could a nice guy like Benedict Cumberbatch annoy anyone? * Has social media shrunk our brains? * What happens to a sense of shame when men visit the gym?Part polemic and part diary, Collins spent a year documenting all those areas (and people) that could bug the hell out of the calmest of souls. Armed only with a sensible pen, notepad and a standard High Street blood pressure monitor, he sets out to create the ultimate list.In the author's words, 67 People I'd Like to Slap is the non-negotiable oracle of all things bamboozling when it comes to human behaviour - the definitive guide that no sane person could ever argue against. Or could you...? Ian Collins is best known as a radio presenter with LBC, hosting The Late Show. He is also a comedy writer and journalist and a regular pundit for Sky News, BBC News, BBC1's This Week and BBC2's Daily Politics, invariably taking a sideways look at current affairs. You can also catch him occasionally getting a public lashing on Radio 4's The Moral Maze.